The dense, steely clouds gathered over Taos Saturday morning gave way to patches of blue sky and streaks of sunshine as more than 200 people gathered at the heart of Taos Pueblo for a prayerful dance to support Water protectors. 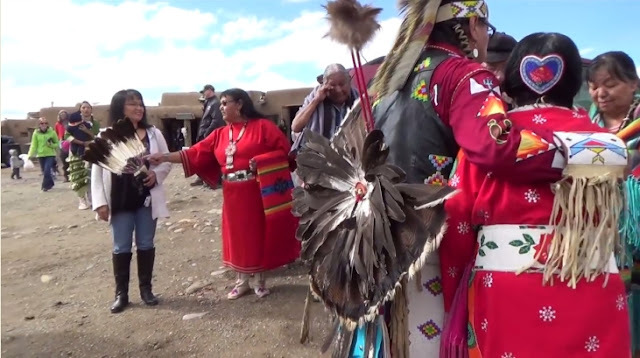 Hundreds of small, silver bells jingled as four groups of women and young girls entered the circle of Taos Pueblo members. Taoseños and visitors came to take part in the “prayer event in solidarity with the Standing Rock Sioux Tribe and their allies,” said master of ceremonies Carl Winters, who grew up just 20 miles south of the proposed pipeline. “This movement is based on prayer and ceremonies. It’s happening daily. You go to sleep at night to the sounds of the drums,” Winters said. “It’s fitting we should gather in the presence of this water from the sacred Blue Lake,” he said. Mike Concha, senior councilman at Taos Pueblo, Lt. Gov. Harold Cordova, War Chief Richard Archuleta and Howard Bad Hand all offered words of prayer and support for the family and friends in North Dakota. The organizers of the dance urged people to contact the White House, congressional representatives, the Army Corps of Engineers and the pipeline builders to demand a stop to the pipeline. Donations can be made online at ocetisakowincamp.org. Responses to "Water is Life: Taos Pueblo Supports Standing Rock"